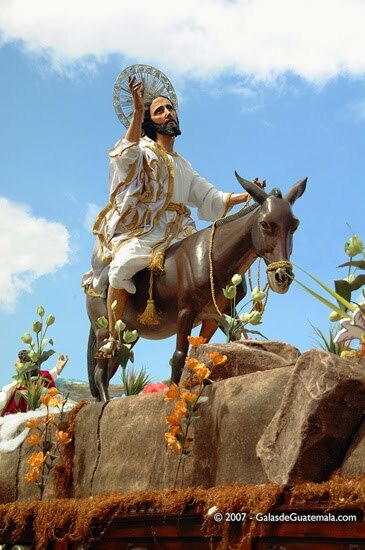 I am going to make a stop in our journey through Guatemala because we are at the beginning of the Holy Week and, just as I have mentioned before, Guatemala is notorious around the world for the celebration of this time of the year. 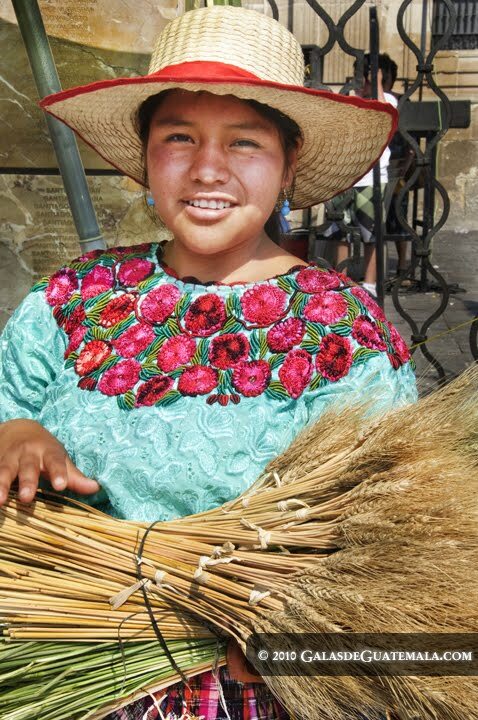 Whether it is celebrated according to the most traditional catholic rituals or within the magic syncretism that characterize the indigenous communities, the Holy Week throughout Guatemala is much more than a worthy experience. If the symbols used along the Lent season, as we appreciate in Guatemala, are right or wrong, that is something that won't be analyzed in this space. 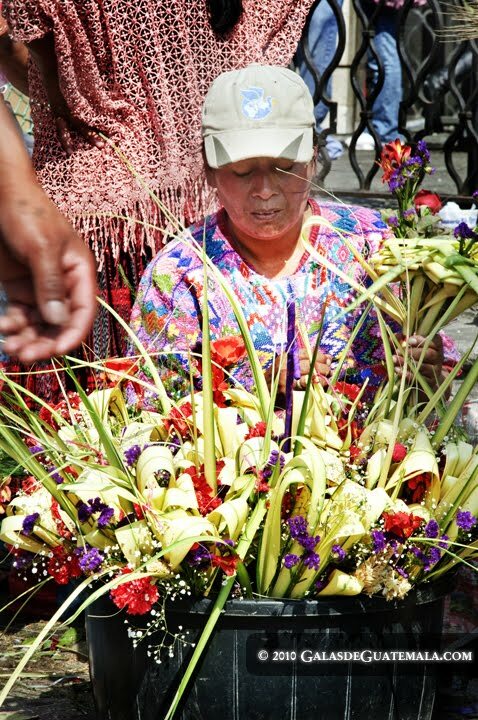 What I intend to share with you, is all the paraphernalia and the meaning of every ritual, from blessed palm bunches, to "cucuruchos", colorful flowers and sawdust carpets, processions, and even food the Holy Week involves, which culturally speaking, is the voice of the people. The palm leaves (palma real or manaca -Orbygnia cohune) are collected in Escuintla, Suchitepequez, and Quetzaltenango and delivered to the vendors, generally women from San Juan Sacatepequez. These industrious women make the arrangements bunches-like adding some purple estaticias (Limonium sp. ), red carnations, corozo (Corozo oleifera) flowers, and some other elements like the wheat spikelets carried by the beautiful girl in the photo above and to the left. 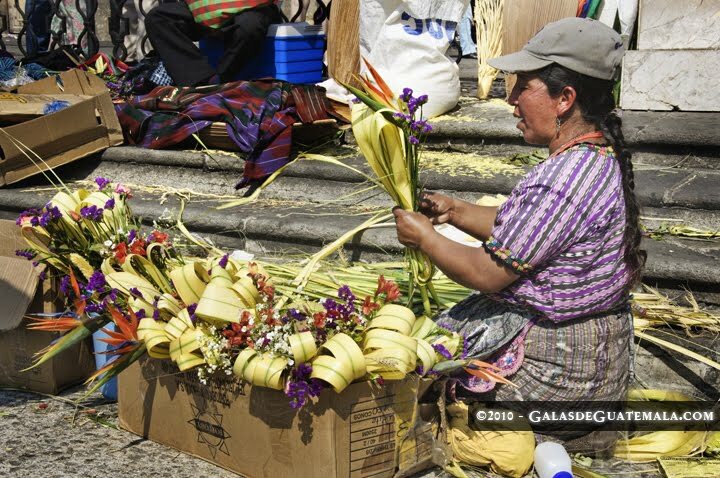 During the night of the previous Saturday or very early that Sunday, these women arrive to the churches with their precious cargo and before they start selling the bunches, these are blessed by a priest. The blessed bunches are kept in the houses for almost a whole year, until the next Ash Wednesday, when they are returned to the churches to be incinerated and used to draw a cross on the parishioners' forehead, a ritual that marks the beginning of a new Lent period. 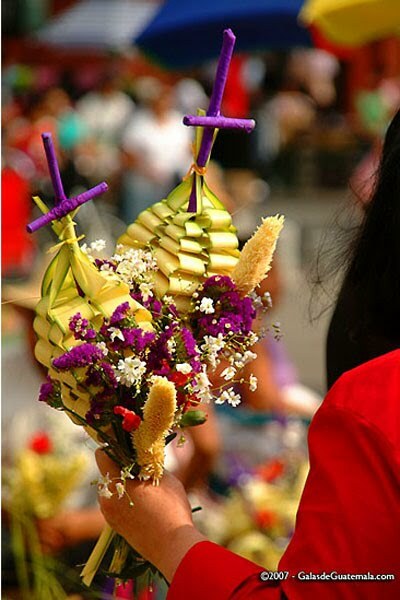 Since processions are one of the most important popular expressions during the Holy Week, the Palm Sunday is not an exception. 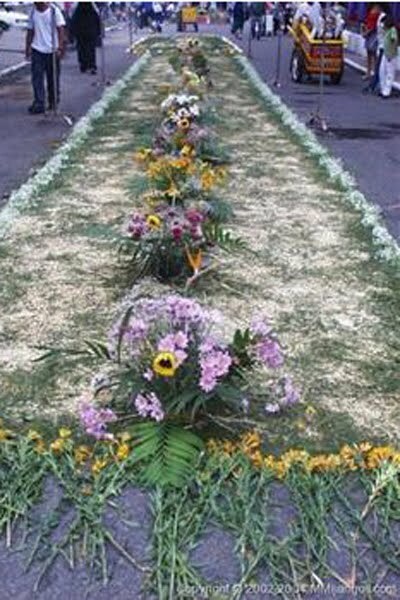 As we can appreciate in the photo above and to the left, it is a representation of the entrance of Jesus to Jerusalem, and as in every procession, beautiful sawdust and flower carpets are made along the route for the procession to pass over. All of the photos in this page are posted with the authorization of galasdeguatemala.com.